Turret Lathe's Mark One paid for itself in less than 14 parts and cut lead time from weeks to hours. For over 40 years, Turret Lathe Specialists, Inc has been churning out customer parts, be they one-off prototypes or larger production runs by leveraging their wide range of capabilities from high quality manual machining to CNC precision operations. Juggling orders and batch lead times, Quality Manager Daniel Shepherd is always under pressure to design and implement more efficient solutions: “The capabilities we have — with the conventional milling and turning we can offer — allow us to do short production runs. Because that’s something we excel at, our customers started giving us some of their one to two piece rapid prototyping jobs.” The company needed to find a way to fulfill these orders without burdening their larger production runs. One of Shepherd’s recent projects has involved fitting a carburetor on a 2.0L four cylinder engine and putting it all into a 1978 Volkswagen Rabbit, a car usually used for period-accurate racing. Shepherd needed a manifold to connect the engine to the carburetor, but the manifold he needed was impossible to get new. “Any versions of that part you would find today, the casting was one of the last made, you could tell the mold was blown out, and it probably shouldn’t be turning out parts anymore,” as Shepherd described. He challenged himself to make “not only an available manifold, but one that was lighter weight, more effective in terms of flow and fit, and simply one that’s more affordable.” After some initial design and prototyping, the design proved to be prohibitively expensive to manufacture. With runners in the manifold machined from solid aluminum, the manufacturing price was nearing $2000, ten times the price for used manifolds on the market. Then it was just a matter of selecting a printer. “What we needed in a printer was something that fit on a desk, that didn’t cost as much as a huge industrial machine, and that turned out precision parts...Markforged was able to deliver on that,” Shepherd explained. 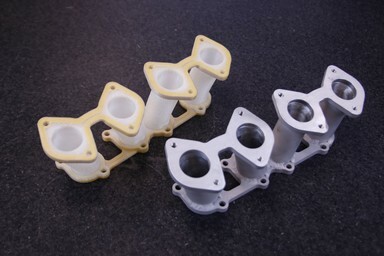 The fiber-reinforced capabilities of the Markforged 3D printer only solidified the deal: “The realization that we could turn out a part made of nylon with a few layers of composite fiber in between, and have it stand up to the same needs and abuses that we’d put aluminum parts through was really the thing that sealed the deal with top management for our Markforged printer.” Turret Lathe no longer needed to interrupt long product runs to make single parts; the Markforged could match the strength and precision of their best machines by 3D printing end use products or prototypes. A comparison of the Markforged 3D printed parts and the machined aluminum parts.